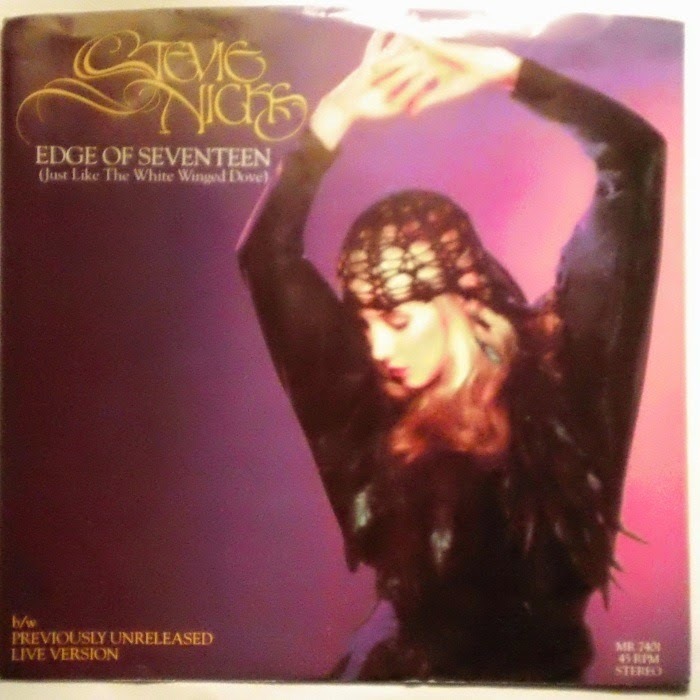 "Edge of Seventeen", is a song written and recorded by Stevie Nicks. It was the third single from her 1981 solo debut album, Bella Donna. According to Nicks, the title came from a conversation she had with Tom Petty's first wife, Jane, about the couple's first meeting. Jane said they met "at the age of seventeen", but her strong Southern accent made it sound like "edge of seventeen" to Nicks. The singer liked the sound of the phrase so much that she told Jane she would write a song for it and give her credit for the inspiration. Although Nicks had originally planned to use the title for a song about Tom and Jane Petty, the deaths of both her uncle Jonathan and John Lennon during the same week of December 1980 inspired a new song for which Nicks used the title. Nicks's producer and friend, Jimmy Iovine, was a close friend of Lennon, and Nicks felt helpless to comfort him. Soon after, she flew home to Phoenix, Arizona, to be with her uncle Jonathan, who was dying of cancer.